Uplink: Innovation — The Aerospace Company, The space community was in search of a standard to make launching smallsats more flexible. The Aerospace Corporation (Aerospace) has developed a new and innovative smallsat standard called a Launch Unit (Launch-U). SSL, a Maxar Technologies company, designs and builds advanced spacecraft systems that enable the firm’s customers to connect, inform and protect people around the globe. Engaging in innovative design, development and the manufacture of mobile, satellite-based antenna systems that are focused on the delivery of broadband internet to any location, C-COM Satellite Systems has developed a proprietary, one-button, auto-acquisition controller technology for rapid antenna point a to GEO satellite with the press of a single button. At last we know ­— on July 12, the FCC Commissioners (via a 4 to 0 vote) backed the proposal by Intelsat and SES (with Intel) to see a restructuring of C-band spectrum over the U.S. to help develop 5G — the firms wish this to occur rapidly and might even extend the concept from an initial 100 MHz to 200 or even 300 MHz. EVERYWHERE Communications LLC launched in June of 2018. To learn more about this enterprise, Patrick Shay, the founder and CEO of the company, discussed this new endeavor. A new era in mobility and communications is now being entered — an era that is exciting and challenging and one that has the potential to take connectivity to a entirely new level of access and use. The new space economy presents an opportunity for game-changing innovation through the evolution of satellite capabilities, from communications and transmission platforms to those with cloud service capabilities such as storage and computer resources. Selling bottled water in space may seem like a giant leap for mankind. However, the news that Surrey Satellite Technology Ltd. (SSTL), Goonhilly Earth Station and Astrobotic have joined forces to design the sophisticated infrastructure required to support a new era of private and public sector lunar endeavors brings this idea into closer orbit. Being born in the 1960’s, I’ve always felt miniaturization is cool. That feeling hasn’t always been shared by my three lovely daughters, taking them round a model village on a nice summer’s day looking at the amazing miniature railway junction box. Or, closer to their interest, marveling at how many thousands of milliamps per hour they can now squeeze into a smartphone. They just don’t get it and look at me like I’m some boggle eyed alien*. The market for top tech talent is highly competitive. To meet recruiting goals, employers need to improve the candidate experience and sharpen their social-recruiting practices. It is hard to read anything about business or technology these days without coming across the Internet of Things (IoT). In 2014, for the first time, the number of mobile phones and other devices equaled the number of human beings on Earth, about 7.2 billion. The analyst firm Gartner says that by 2020, there will be 26 billion connected devices — and most of them will be connecting with other devices rather than people. The vast amount of plastics produced throughout the world is causing a monumental problem for the governments and organizations that must tackle this growing waste materials crisis. From mission-critical communications to virtual business meetings, advancements in consumer and government communication technologies over the years have driven a rising demand for reliable connectivity around the world via Low Earth Orbit (LEO) satellites. NASA is sending two cubesats to observe Mars — the agency is exhibiting some significant changes and adjustments in the electronics and the design of smallsats with this mission. The current state of the art for interplanetary space travel is essentially unchanged from the techniques that were used to send Mariner 10 to Venus and Mercury in 1973. Once in space, a satellite’s chemical rocket engine provides high thrust for a very brief period, starting a long coast phase that takes advantage of as many gravity assist maneuvers as possible. Many months or years are then required to travel anywhere interesting — even maximizing propellant efficiency in this way, there are still significant limitations placed on spacecraft mass and payload. President of the Mobile Satellite Users Association, Catherine spearheads the group’s mission to promote mobility market development and mobility innovation. There are a number of points to consider in any conversation concerning the broadband issues that the United Kingdom (UK) currently faces. The promise of 10Mbit/s for everyone in the country is an empty one, at least in a world where the government refuses to consider satellite connection for rural areas or considers allowing thousands of satellites to be launched into space by multiple companies. Uplink: Innovation — AsiaSat, Wet antenna attenuation? 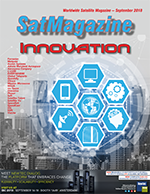 AsiaSat has investigated C-band’s exceptionally high rain fade attenuation reported by uplink stations during monsoon seasons in South East Asia — techniques for uplink station operators to mitigate against these issues, to improve their service level availability, are presented in this article.